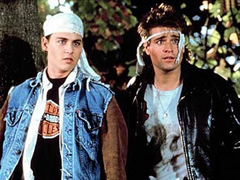 21 Jump Street — Superbad star Jonah Hill has plans to resurrect the 1980s TV show that helped launch Johnny Depp into stardom. Hill wants to make a big-screen version of the show and, as you might have guessed, do it with a comic twist. For now, he’s committed to executive produce and help write the script. He may end up starring in the movie as well. Actually, Hill is so committed to the idea that he told MTV Movies that he turned down a role in Transformers 2 to do it. Hill knows that, after the big success of just one movie, he’s still virtually an unknown to audiences but wants to assure skeptics that, “If it doesn’t turn out funny, I promise we will not make it.” Neal Moritz (I Am Legend) and Jump Street co-creator Stephen J. Cannell will produce the movie. No word if any of the original show’s cast will be asked to participate. The Flintstones — Six Greenpeace activists dressed as cavemen and traveling in a Flintstones-style car were arrested in Brussels recently. The modern stone-age wannabes were there to protest the influence of automakers have on proposals to decrease carbon monoxide output. Greenpeace transport campaigner Melanie Francis said, “Our activists and their zero-emission vehicle are raising the alarm about the influence this dinosaur industry exercises over EU climate policy.” Unfortunately, the group’s stone tablet was confiscated before it could be delivered to European Parliament lawmakers. Happy Days — Several months ago, you may recall that we told you that Milwaukee residents were trying to raise money for a statue to honor the iconic Fonz character from the 1970s sitcom (which was set in the Wisconsin city). They’ve now reached their financial goal and the dedication has been scheduled for August 19th. Aside from Fonzie himself, Henry Winkler, other castmembers scheduled to attend are Tom Bosley, Erin Moran, Don Most, Marion Ross, and Anson Williams. Happy Days creator Garry Marshall will be on hand as will Penny Marshall and Cindy Williams from the spin-off Laverne & Shirley. The Sopranos — James Gandolfini is auctioning off some of his clothes. The actor’s contract for the HBO series allowed him to keep his Tony Soprano wardrobe so he’s selling two dozen outfits to benefit the Wounded Warrior Project, a nonprofit group that assists severely wounded soldiers in Iraq and Afghanistan. Among the clothing on the auction block are the blue button-down shirt he wore in the opening credits, the outfit he wore when he was shot by Uncle Junior (blood-spattering included), and even Tony’s trademark bathrobe. The auction is being conducted by Christies and will be held on June 25th. Stay tuned!